Welcome to our creative Sunday, Monday and Tuesday. With holidays approaching am taking time for me, family and friends thus, I am combining some posts to limit some blogging time and also want to be able to respond to bloggers' comments which we enjoy so much. Are you busy also with the preparation of the holiday? What holiday is foremost in your plan? Winter Solstice? Christmas? Kwanza? and more?What is your favorite part to the holidays? I love the lights. 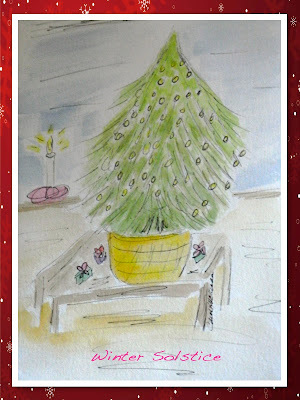 The tree lights, the window lights and Winter Solstice a time of honoring the light beginning to return ever so slowly. I also love Christmas and celebrating with family and friends. I am also preparing for another Holiday Show that will run through the 23rd of December. I will have some photography and mixed media being displayed and for sale. All of these times are creative to me and enhance and strenghten my creative spirit. Hope you have enjoyed our array of creative expressions and will check all the creativity on the blogs listed above. QUOTE FOR THE DAY: 'The great question...which, I have not been able to answer, despite my thirty years of reseach into the feminine soul, is 'What does a woman want?" Lovely photo of Miley and Owen. 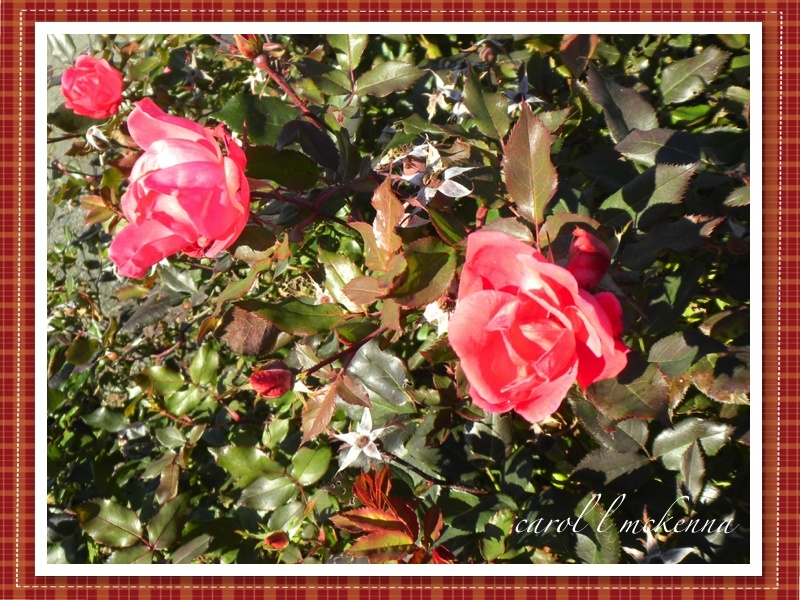 The roses are beautiful and so too is the photo of the winter morning. but suppose I had better get my head in gear! The great question is not a great question. There are others which are greater. But these are my secrets. Very nice work! The children are delightful and the Sunday sketch is so fun and creative! Such richness in your combination posts; every part of it radiates joy. Lovely sharing...thank you so much. Thank you! No word verification, just the Blog Owner approval message. :))) I greatly dislike commenting on blogs that use Word Verification. It's so frustrating as some of the words are very difficult to read and can take more than one attempt to get it right. I tend to move on if my second attempt is rejected. I've never had Word Verification on my blog as I just wouldn't put my readers through the frustration when there are other options? lovely blog, I like the shot of the roses and the haiku. 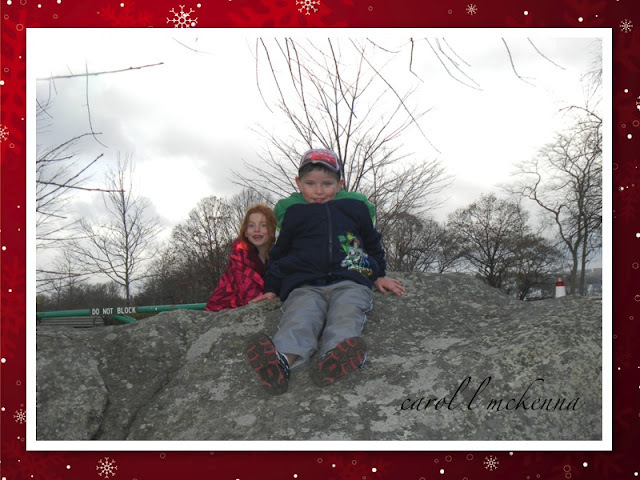 Love the Christmas tree, love the photo, love the haiku. As I read your haiku for today's Carpe Diem I had to smile and look outside. Today here a raging storm with heavy rains is torturing the country. Last leaves falling and some leaves struggle to stay where they are, but they loose after a while. It's really nature's cleaning day here. Well ... I think that I have to sweep my garden tomorrow (smiles). What a wonderful created haiku Carol and ArtMuse Dog. Really stunning haiga. Thank you for sharing this wonderful creativity with Carpe Diem. Winter holidays sneak up fast Happy SS! beautiful photos and I love your Christmas tree, it has a country feel to me! I'm taking the holidays one day at a time but have to work on the Christmas shopping! It snowed here today for the first time! A rain as a cleaning day makes me much more happy for the fact it comes. Love your muse...so sweet! You are involved in a lot this month! Wow! You've always got a little of something beautiful for everyone. 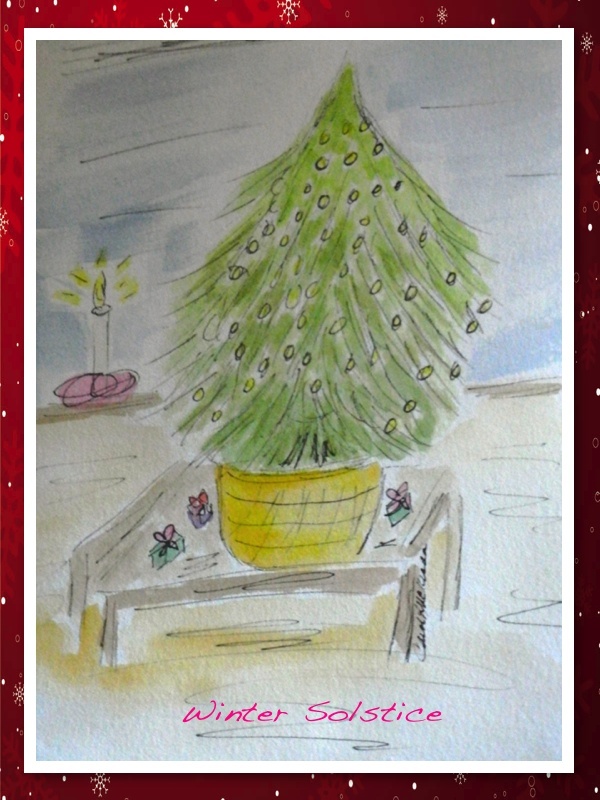 A beautiful sweet little tree painting--looks perfect for a greeting card. Lovely roses too! Your posts always delight me with your images, your words and your photos. Beautiful! Love your little holiday sketch. Aww. Very sweet. :) Happy SS! Great tree sketch. I love all things tree! Cape Ann looks like a gorgeous place. Christmas preparations begin at our house the week after Thanksgiving, so I'll be gearing up for all the festivities beginning tomorrow. Yikes! Happy AEDM! Fantastic photos, sketches and poems! I agree with you... I love the lights of the season... And, of course all the celebrations with family and friends! Thanks for all the joy you share in your post. A great quote from Freud. I totally enjoyed reading through all your different postings-in-one just now. 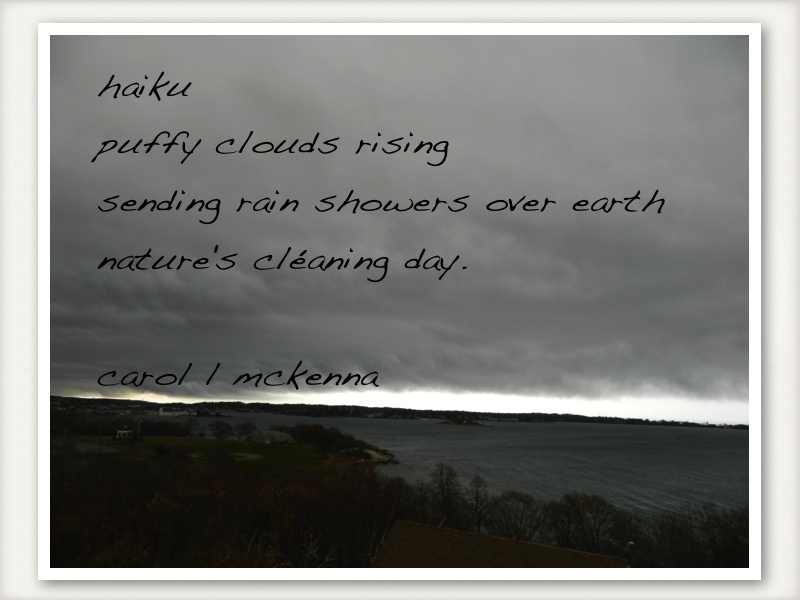 There is so much beauty wrapped up in a small package...my personal favorite being the puffy clouds haiku...genius! I like your sketch - reminds me of the season!nice haiku also i likke the notion of natures cleaning day! so much beauty here today! thank you carol for your generosity in sharing so fully from your creative world. It's that time of year again for bringing the tree inside:) lovely photos too! I love your Christmas sketch....I am going to have to stretch myself at some point next year and explore that area. wonderful pictures you shared. thanks ! Your winter morning shot really belongs to paradise! I agree that in busy times it helps to blog in blocks. Just good sel-care. Especially enjoyed the haiku! I hope you do well at your holiday sale. Your pictures are very lovely. I love the Winter Solstice sketch. What a wonderful selection. Particularly like the Winter morning on the cape. 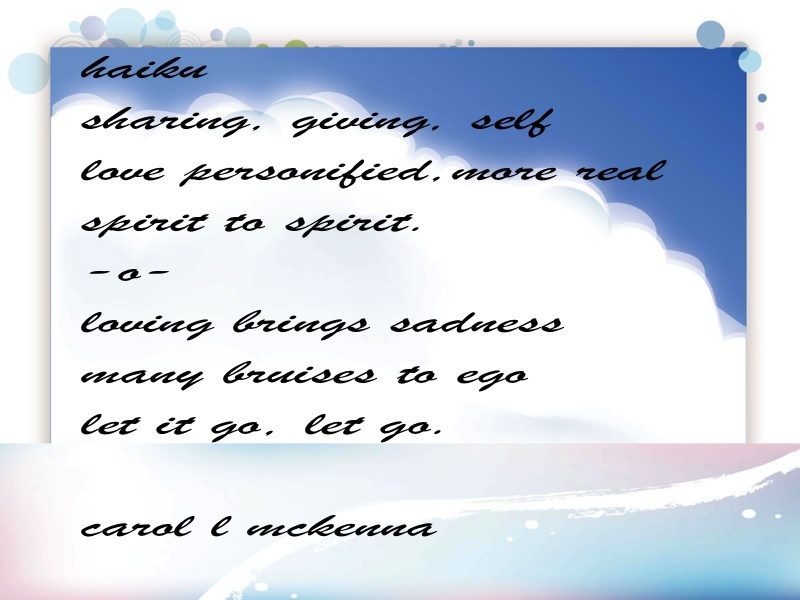 Hello Carol, so much to view here today, love your photos and haiku, enjoy this wonderful season! Every time I see your profile shot, I smile! I just love your cute doggie! I love Christmas, the lights are part of my favorite part of the Christmas holiday! I do enjoy decorating our tree. I love your photos, the water scene is gorgeous! Lots of wonderful captures for the day, Carol, and wonderful haiku!! Hope you have a good week! Oh, how I love the Freud quote. Perfect exclamation point. The little red haired girl is adorable. What a face! As for what holiday I am looking forward to the most, I have to say Christmas - which is also my daughter's birthday. She has been studying in Scotland and I can not wait to see her (and hug her!) again! Thanks for commenting on my blog! Amazing colors! You should stop by my blog on Friday and submit these to Orange You Glad Its Friday, a meme celebrating the color Orange! Hope to see you there! lovely photos and great haiku. the shot of winter morning is particularly beautiful. 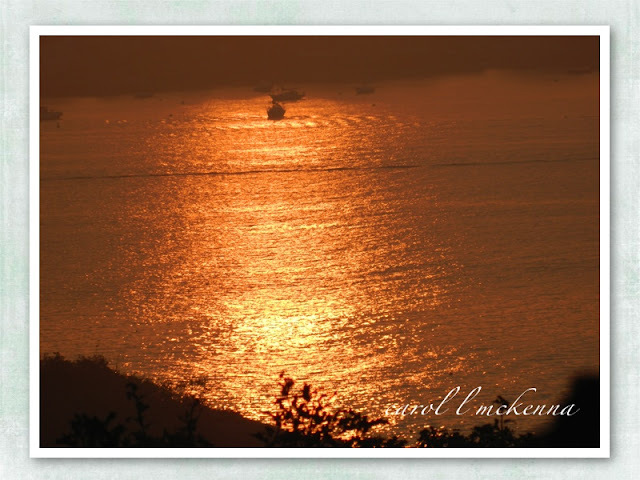 Lovely pictures - I especially like your haiku and the sunrise. Nice haiku and photos, I love that sketch! I wish we'd get some of those showers, for the first time in decades we've had a completely dry November here. Beautiful art,photography and verses! Love the winter solstice painting and the the quote! Your photo of "paradise" makes my heart sing! Lovely haikus and a wonderful golden shot! I haven't seen a winter morning in person, but it looks like it is very much the same as our tropical mornings, as shown here! thanks. the sunset turned water into liquid gold. beautiful photos. Thank you for commenting on my blog and I enjoyed your post with sweet photos. Fun post!! Boom & Gary of the Vermilon River, Canada. Beautiful post, I love your sketch. Your sketch is wonderful! I love the whimsical Christmas tree. Gorgeous photos and sunrise. Wishing you a fabulous week. Love the roses and the sunset. Christmas is all about the family but I do love going into London and looking at all the wonderful window decorations and lights. Everywhere is so festive. Must take some photos of the decorations and share them soon. Beautiful and breathtaking! Your haiku poems are also very good. I love Christmas decorations. My twin and I got a lot as gifts over the years and we bought some every year! I also love the lights. All the very best at the sale. Your work should do very well. Take care and enjoy the holiday season. For some reason, my computer won't allow me to make a comment at day 10. But, I wanted you to know I had visited. I get annoyed when a glare comes off a piece of art with or without the flash. Sometimes I take the piece outdoors to photograph and the glare isn't as bad.